Warehouse worker Matti Sinisalo says that chemical risks at work have received a lot of attention. – There is chemical control, training and instruction about dangerous substances. For example, solvents are much less used now. New employees don’t work alone, a more experienced person is always with them. Controlling chemical risks is a question of life and death in the glue business. 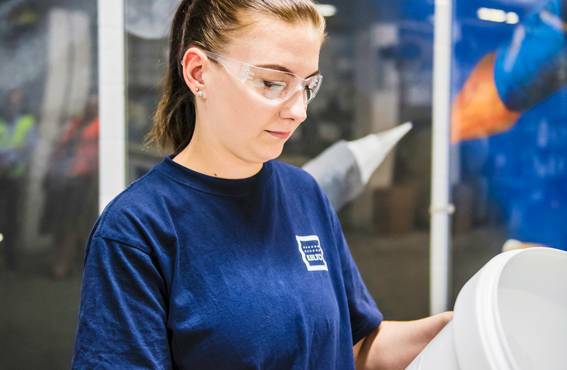 Risk control and safety are in top shape at Kiilto, an enterprise specializing in adhesive substances. Each employee is encouraged to develop and improve his work environment. The factory’s spacious warehouse at Lempäälä is filled with jars, buckets, sacks, canisters and containers. They contain different kinds of glues and adhesive substances. The products are sent to industries in containers, most of which can be recycled. The Kiilto factories manufacture about 900 different products, and the number of trade names is twice as many. – The size of the packages ranges from one desilitre to a cubic metre, says Jyrki Tiihonen, Manager of HSEQ (Health, Safety, Environment and Quality). Laura Kivistö lifts one bucket at a time from a pile of empty plastic buckets in the packing department and slaps a label on each one. 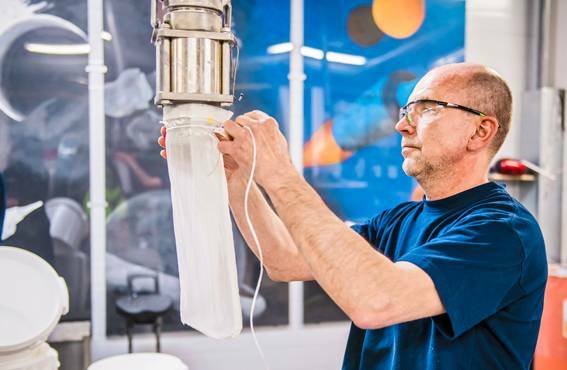 Her workmate, Marko Koskipää is fitting a tight mesh bag over the mouthpiece of the glue machine. Soon thick white glue starts to flow through the filter into the buckets. – The employees use protective goggles and gloves when working. The task lists show what protective gear must be used in the different work phases, says Koskipää. Some tasks are still manual in the packing of glues, while the packing line of waterproofing products is automated. 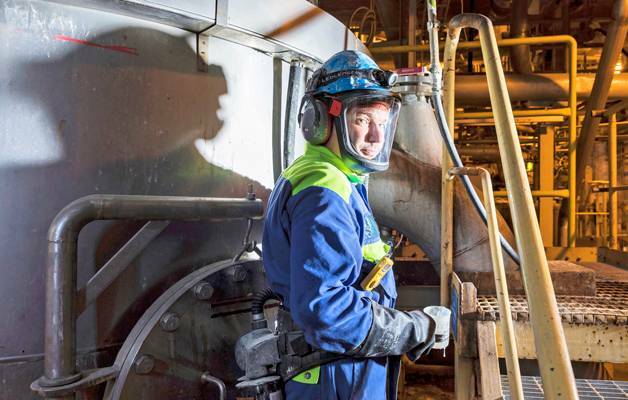 Kivistö, who is a substutute occupational safety delegate, says that chemical issues have been discussed a lot at work, and the employees are well instructed. – We are also encouraged to participate in many kinds of training. It’s easy to commit to the work when you can influence your own work. 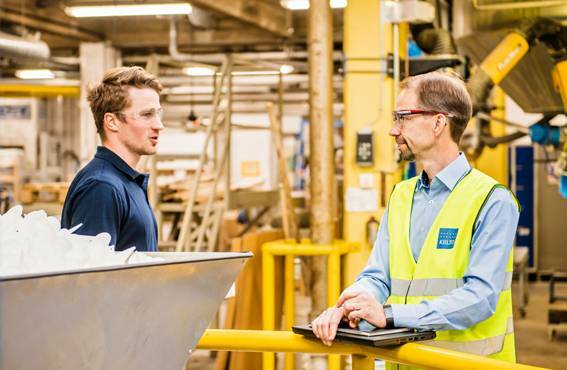 Matters related to health, the environment and safety are overseen by Jyrki Tiihonen at the Lempäälä factories. 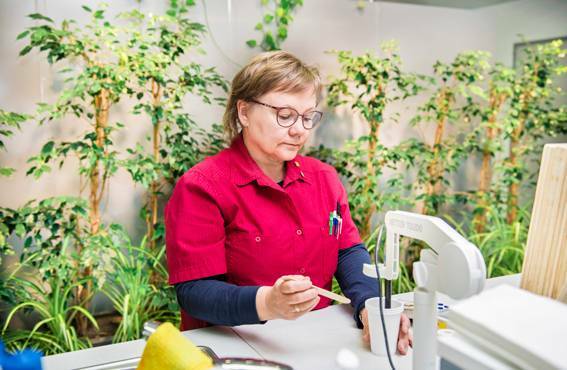 In the production halls every visitor – also Health, Safety, Environment & Quality Manager Tiihonen – uses safety goggles and an attention safety vest. On the left, quality and development engineer Matias Hamnström. A total of 500 different substances are used for making glues, lacqueurs and waterproofing materials at Kiilto. Some products are bio-based, for instance foundry resin is a by-product of sugar cane production. There are many graphic and verbal instructions in the factory spaces, and one has to know what the signs mean. One sign guides you to the emergency shower, and another one points to the place for rinsing eyes. – Leaks are always a hazard here. A person can get a splash on their skin or eyes. Isocyanates are the most hazardous substances – they can cause respiration symptoms, and sensitization can lead to allergy or asthma. That is why their handling is controlled strictly, says Tiihonen, who is responsible for occupational health, safety and environmental issues. Risks are controlled in numerous structural ways. Splashes can be partly prevented by keeping the machines in working order and conducting periodic maintanance check-ups. The location of the machines is also planned carefully. It is imperative that in a chemical plant all chemical agents are taken into consideration in work guidance and training. – The employees take part in chemical training regularly, and their occupational safety card has to be renewed every five years. If the normally used substances, recipes, or work tasks of an employee change, his work guidance and instructions are changed accordingly, says Tiihonen. – The workplace guidance and instruction programmes for new employees are comprehensive, and safety matters are continually communicated on different channels. Also office employees are informed about anything that is relevant to them, says information officer Laura Heinovaara. Kiilto employees are encouraged to observe their own work environment and to report safety deficiencies right away. Laura Kivistö from the warehouse says that this is a good practice, and also she has reported some improvement needs. Accident statistics are different every year. – We havent’t had a single accident since last October, Tiihonen is pleased to say. Kiilto is a member of the ’Zero accidents’ network along with 400 other Finnish workplaces. This ambitious goal is possible. It is based on understanding that accidents don’t happen by chance, they have concrete causes. This means that they are also preventable. The network gives level classifications to member workplaces that have successfully promoted safety. The frequency and seriousness of accidents are criteria in the evaluations. Accident investigation and the procedure of informing about hazardous situations have to be in order. This year Kiilto rose to the second best safety level. – Perhaps next year we will reach the top level, hopes Tiihonen. There are many ways to reach the top. For instance, informing about safety shortcomings has been made easy. It can be done quickly on an intranet form or with a mobile application. Laura Kivistö says she too has sent in several observations of improvement needs. – Some of the problems I have been able to fix myself, but I have still forwarded them. – It’s a good thing that all problems are recorded, so the management is aware of them, Marko Koskipää adds. The production supervisors go over the messages once a week, so that the defects can be dealt with right away. Jyrki Tiihonen says that the employer’s wish to get numerous obsevations may sound illogical, but it pays off. – When people keep an eye on their own work environment, their awareness of overall safety increases. It’s important that everyone is working safely. Safety observations guide people to improve safety with even small deeds, and thus help prevent accidents. In an employee happening we once asked people to try to do someone else’s work task for a short while. It made people realize how important all work tasks are. Blue-and-white buildings, towers, silos and containers are spread over the large factory premises of the one-hundred-year-old family enterprise of Kiilto. The building complex is located at Sääksjärvi between the new highway and the old road to Tampere. The chemical factories are surrounded by beautiful green woodlands. The slopes are covered with patches of blueberry, and the employees have followed the life of a family of foxes in the yard. Even some safety improvements have been achieved quite naturally, along with the general trends. For instance, the manufacture of solvent glues was discontinued at the beginning of the year. – Two decades ago they were used widely, but in the past few years their use had dropped to about 1%. Now all of our glues are aqueous, in other words water-based. The trend has been the same in the paint industry, says Tiihonen. Kiilto develops all of its products by itself. 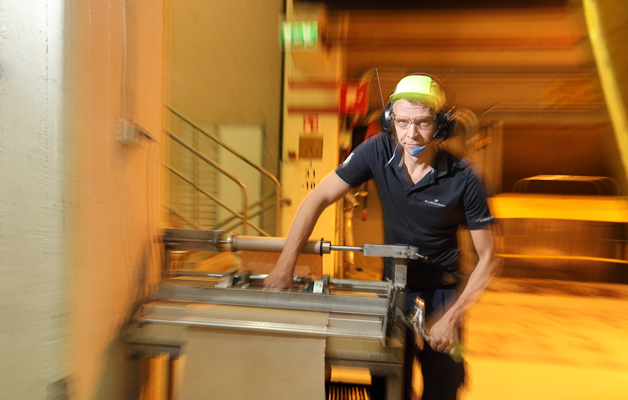 One fifth of the personnel at Lempäälä factory are engaged in product development. There is also greenery in the research centre: many luxurious green indoor plants grow in the well-lighted space. Tuija Haavisto is mixing something in a cup with a thin wooden stick. The work site is a kind of ’kitchen’, because the research assistant’s task is also to try out glue recipes. Sometimes the recipes include hazardous or dangerous substances, which must be handled in the flow cabinets along the wall. The closed space prevents the vapours and splashes from contaminating the room. – We continually try to do things in a more ’green’ or ecological way. It is very motivating. A product that is as green as possible, is good for us employees, the customers and the environment, says Haavisto. Kiilto is a non-smoking workplace, because the chemical industry and tobacco products that increase the risk of accidents don’t go together well. The occupational health service personnel support people in their efforts to quit smoking. Marko Koskipää from the warehouse participated in the support group for smokers. He has now been a year without smoking, and means to keep it that way. 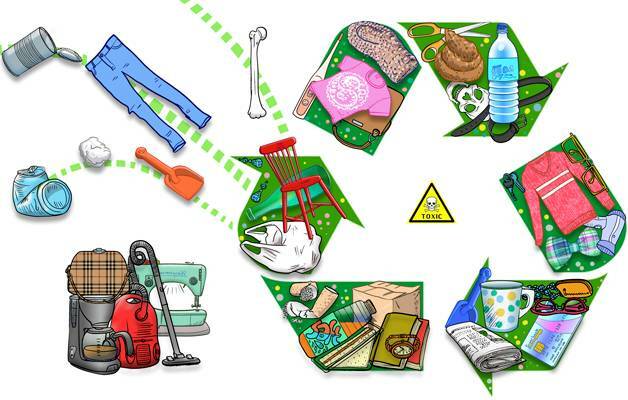 Kiilto is aware of and recognizes the harmful effects and hazards of its hundreds of raw materials. – We carry out assessments of chemicals together with the occupational health services. Every few years they are up-dated by the departments, says Jyrki Tiihonen. The so-called principle of primary protection is followed in risk control. A lay person might think that personal protectors come first when dealing with chemicals and chemical reactions. – It is nevertheless the last of many means. The first step is to find out if a safe substitute can be found to replace a hazardous substance. The STOP concept comes from the words: Substitution – replacing hazardous substances with safer alternatives; Technological measures – technical systems, such as closed systems or local exhaust systems; Organizational measures – procedures related to the organization, such as restricting the number of exposed workers or exposure times, guidelines and training; and Personal protection – the use of personal protective gear. – Many of Kiilto’s products are safe compared to their raw materials. Particularly the characteristics of monomers are completely altered when they become polymers. Monomers are tiny molecules that bind with other monomers to form polymers. Knowledge of their effects is increasing all the time, new chemicals come to the market and old ones disappear. – This year the classification of one chemical was changed – it was found to be dangerous to fetuses. Our research centre began to look for a substitute and found one. One carcinogenic substance is in use at the polymerization plant, and thus far there is no safe substitute for it. Exposure measurements are made at intervals of a few years. All factory units have been assessed in the 2010s, and nothing alarming has been found. Safety can often be improved in simple ways, for instance by avoiding manual handling, so that an employee is in touch with a hazardous substance as little as possible. Tiihonen praises the employees of Kiilto for their initiative and spontaneity. – The employees make many suggestions and express their wishes; they may want to try out for instance a new type of glove. We don’t have to push our people to use new personal protectors; usually it goes the other way around. The workshifts are planned so that a sufficient number of the factory’s own firemen and employees with first aid skills are always present. The work-shift lists are drawn up so that a certain number of the factory’s own fire-fighters and persons with first aid skills are always present. The voluntary first aid course has been full every year. The people are keen to up-date their know-how. Marko Koskipää at the packing department says that he attended First Aid Course 1. Although he hasn’t had to use the skills at work, he felt that the voluntary course was useful. Research assistant Tuija Haavisto teaches first aid – she has years of experience and finds the work inspiring. – We have a splendid group of ten persons, we have first rate equipment and gear, and we practise once a month. The certificate for the first aid couse is valid for three years. We continually take part in training, and the members are very committed. I myself just attended a course for first responders. According to Jyrki Tiihonen, many people have completed at least the First Aid 1 course in all departments, including the office. Once a year the entire personnel participate in a ‘safety day’, during which we go over important current topics, and review first aid skills. The main theme next February is the campaign of the European Agency for Safety and Health at Work: “Healthy work – Recognize and control chemical agents”. Research assistant Tuija Haavisto is pleased that the workplace has become greener than ever. She reminds that green products are good for the employees, customers and the environment. Help, the smell of smoke fills your nose and stings your eyes. There is a fire in Lempäälä! Tweets have spread the news that highly inflammable vinyl acetate monomer has leaked from the Kiilto factories. A fire rages over the industrial area, the burning chemical spreads dangerous smoke into the environment and the motorways close by. Fortunately the above incident is imaginary, but last autumn a rescue operation drill was organized to tackle an imagined major disaster. The practice regularly up-dates readiness to deal with a possible crisis, just in case. A crisis launches a carefully planned chain reaction, in which all posssible actors participate: the rescue department, insurance company, the municipality, and Tukes (Finnish Safety and Chemicals Agency). An emergency situation must be practised in order to find the weak links of the chain. – In an accident situation, communication is of vital importance. In the accident drill last autumn, it was my job to coodinate the various communications, says Laura Heinovaara. 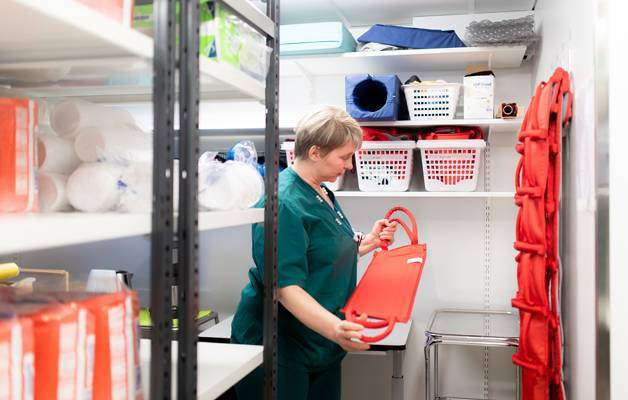 The most serious accident risk at Kiilto is associated with the raw materials of polymerization, breakage of the container, leaking, and possible ignition. After the polymerization process, there is no risk of fire any longer. Smoking has been banned at Kiilto as an absolute fire preventive measure. At the beginning of 2018 smoking has been prohibited inside as well as outside the factory premises. – The chemical industry and tobacco products that increase the risk of accidents don’t go well together, says Tiihonen. This new restriction was a big deal for some, but the solution has mostly been welcomed positively. The occupational health service has offered personal support for those who want to quit smoking. – A smokeless workplace is a good thing, although it doesn’t affect me personally. 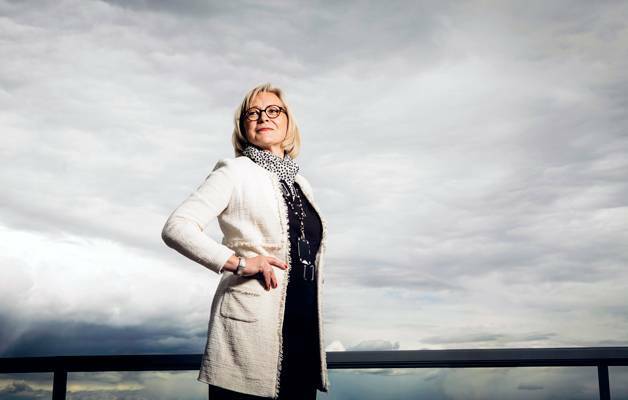 I’m glad that the employer has encouraged people to quit or reduce smoking, says Laura Kivistö. For Marko Koskipää this was a good time to try to stop smoking, so he joined the support group. – I haven’t smoked for a year now, and I mean to keep it that way. A safe and healthy work environment is also an asset to production. A responsible attitude toward safety benefits the business. – Dust or dirt at the workplace doesn’t necessarily correlate with economic output, but a tidy work environment, well cared for processes, and effective risk control affect the quality of the products. This applies also to the subcontractor network, reminds researcher Milja Koponen from the Finnish Institute of Occupational Health. Tiihonen from Kiilto points out that many customers are very interested in safety aspects. – They see the strong link between safety and the enterprise’s whole business activity, and it reflects on the quality of the production and products. A wise man once said that if an enterprise thinks that safety measures are too expensive, they should try having an accident. Accidents are very costly, says Tiihonen. The expenses due to big chemical accidents around the world have been enormous. – A fire in the pigment factory in Pori, Finland, hindered production and had an impact on product deliveries globally. If an accident happens in a chemical factory, it immediately reflects on other actors as well. Questions start to pour in from the worried public and the authorities. The authorities may for instance ask the employer to check out something. After the fire in Pori, risks related to fire have clearly received more attention, and insurance companies have also expressed more interest. At the moment, isocyanates are a worldwide cause of concern, and research is focussed on compounds that are classified as hazardous. – The EU is issuing additional restrictions that apply to isocyanates, and we are following the developments closely. Before we start to use a new raw material, we analyse it very carefully. We try to avoid entirely any chemicals that are on the lists of the Finnish Safety and Chemicals Agency, says Jyrki Tiihonen. Isocyanates are used in the preparation of certain polyurethane-based glues at the Kiilto factories. These glues are used for example in timber gluing and the wood-processing industry. 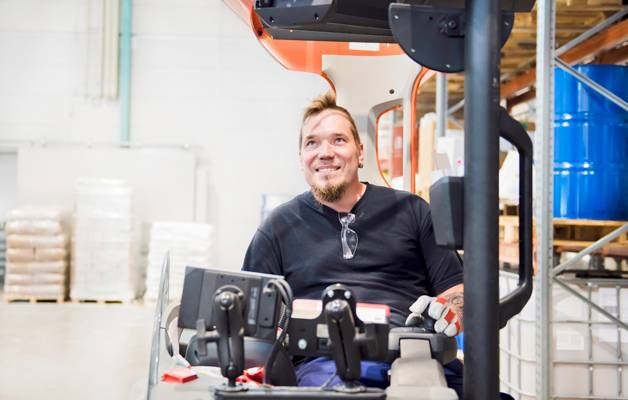 Matti Sinisalo works in the warehouse, and moves around expertly with a forklift. He has worked for 20 years in the factory. – Sometimes I wonder if people would know how to act if, for instance, a container of isocyanate falls in the dispatching department and starts to leak. Would the workers know what to do in a true-life situation, ponders occupational safety delegate Sinisalo. He believes that namely isocyanates pose the greatest risk at work. Discontinuing the use of solvents in the manufacture of glues is a step in the right direction. – There is always room for improvement, but I am certain that we have continually gone in a safer and more positive direction. We have had a lot of safety training. A new employee doesn’t do anything by himself that entails a safety risk. The Chemical Industry Federation of Finlkand is Kiilto’s important collaborating partner, and a channel through which information concerning risk control is disseminated. – Visitors often come to our Lempäälä factory. Our way of managing occupational safety and the employees’ well-being at work arouse interest. We also visit other factories to get ideas. When we wanted to improve fork-lift safety in our warehouse, we visited Nokian Tyres to have a look at their solutions. Many useful practices are passed on at these visits, Jyrki Tiihonen explains. The long-term, systematic and versatile well-being at work programme of the Kiilto Family enterprise has brought good results which have been noted also by others. Our successful endeavours have been acknowledged often. The enterprise has had top ranking for instance in Finland’s Most Active Workplace Survey, carried out by the Finnish Olympic Committee. On Tuesdays and Thursdays the Kiilto employees gather into the research centre’s lobby to do break exercises. – We have many different activity groups, especially physical activites. We support the employees’ sports and physical activities also outside of work, says Heinovaara. – This is a continuous process. We constantly try to think of ways to improve well-being. According to a recent personnel survey, our employees, once again, felt that the workers’ well-being was one of the best things in the enterprise. We look at it from the holistic viewpoint of the employees’ health, coping at work, work ergonomics and safety. All things are interconnected. A chemical industry enterprise which develops, manufactures and markets products used in construction, renovation and industries: glues, fillers, mortars, pastes, waterproofing materials, parquet lacqueurs, and foundry products. The most recent business area is fire-proof products for the packing industry. The turnover is 80.6 million euros, number of employees 385. The main office and factories are located at Lempäälä, Pirkanmaa. Is part of the Kiilto Family Corporation. The other members of the corporation are Kiilto Clean Co. in Turku and Hankasalmi (hygiene and cleaning products for professionals and consumers), Kiiltoplast Co. at Virrat (plastic-coated products) and Intermedius in Tampere (materials used in the manufacture of shoes and textiles, and steel and machine shop products). The turnover of the whole corporation is 153 million euros, total number of employees 800, own subsidiaries in nine countries. The family enterprise was founded in 1919 in Tampere, and has been in the possession of the same family throughout its history. 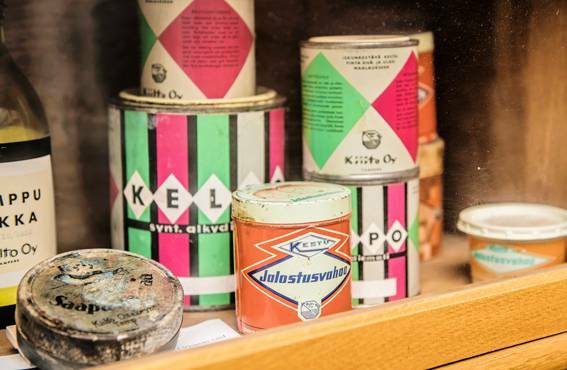 The name was originally Teknokemiallinen Tehdas Oy (technochemical factory) but in 1924 was changed to Kiilto. The project ‘Controlling chemical risks’ (Finnish Institute of Occupational Health, 2017) lists 25 of the most high-risk occupations based on information from registers. Number 1: Jobs involving the use of reinforced plastic; especially laminating boats with styrene resin – a strong exposure agent that causes occupational diseases. 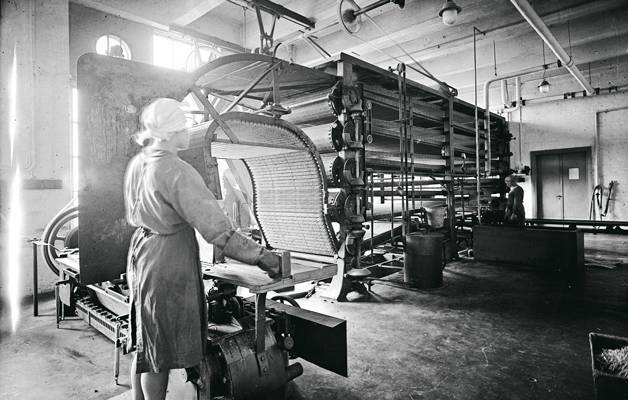 Number 2: Jobs related to demolition of buildings, exposing workers to quartz dust and other dusts and asbestos. Asbestos is a well-known example of a hazardous material. This very noxious building material was once practical and much used, until its harmful effects were revealed. What is the “asbestos” of today, where should we look for the warning signs? – For instance nanotechnology is now being researched actively. Many nanomaterials have proven to be safe, but some things have come up which may involve health hazards, and they need to be looked at more carefully. Asbestos taught us that such possibilities must be studied, says researcher Milja Koponen from the Finnish Institute of Occupational Health. 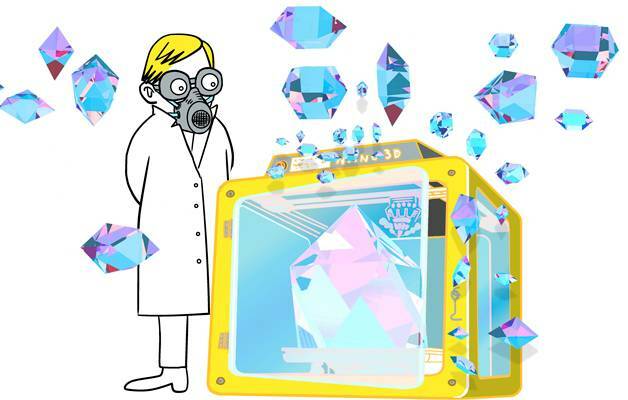 New technologies, such as 3D printing, may require the handling of chemicals in workplaces with no previous experience in their safe usage. As the society shifts more and more toward bioeconomics and recycling, we may well have to face something that we believed to be in the past. – Old exposure agents can surface in the sorting and utilization of scrapped electric and electronic devices. When new materials are being made from crushed waste or recycled plastic, will the processes be carried out properly and safely? ponders researcher Koponen. Last year 8 000 occupational safety inspections related to chemicals were carried out. According to the observations, it is not possible to pinpoint any particupar branch that has problems in every area. – The most hazardous substances are used in the chemical industry. However, most deficiencies are encountered in workplaces where chemicals are not the main business. Safety gets less attention, for instance, in maintenance and repair work, in construction work, car repair shops and paintshops, says senior inspector Satu Auno from the Regional State Administration Agency for Southern Finland. The inspector sees the same problems repeatedly in enterprises. – Risk assessments have not been caried out. Material safety data sheets are lacking, or they are not available to the employees. There are no lists of chemicals, or they are deficient, Auno says. Hazards must be recognized and risks analysed. The Occupational Safety Act and Statute define how a risk assessment is done. Some of the regulations are national, some are EU level. The EU has drawn up the REACH Statute which is a system for registering and assessing chemicals, for defining permit procedures and restrictions. In practice, the control of chemical risks starts from the basics: exposure agents must be recognized. – First of all, one must understand what goes on at the workplace. Are exposure agents spread into the air or on the skin? What kind of containers do we have and what do they contain? Researcher Milja Koponen from the Finnish Institute of Occupational Health mentions some key questions. An inventory of all chemicals used at the workplace must be drawn up and material safety data sheets must be available for all substances. The manufacturer or importer must provide documents that contain identifying information on the substance, its possible hazards to health and the environment, as well as instructions for its safe use and storage. The situation is more complicated if there are no jars with labels or information, and you have to judge for yourself whether a particular work process involves a hazard. – For example, some wood dusts may cause cancer. If no one at the workplace has enough know-how, the occupational health service can offer advice, says Koponen. The risk assessment is deficient if chemical risks have not been taken into account at all. – It’s possible that even the occupational health service hasn’t been thorough enough in its assessment. Chemicals are not an essential factor in all types of work, but there are also workplaces where efforts must be made to recognize potential threats, Koponen says. Large organizations have appointed responsible actors, such as occupational safety committees, ocupational safety delegates and occupational safety chiefs. – In a some small firms the manager himself, for instance, may weld, grind, sweep the floor, do the book-keeping, and handle orders and sales. In addition, he may act as the occupational safety chief. It is understandable if this person doesn’t have enough time or resources to get acquainted with chemical risks in detail. In such cases, Koponen recommends the services of an occupational hygienist. Also senior inspector Auno is concerned about small enterprises. – We have noted that in small enterprises, for instance, workers often neglect to use personal protectors. They are not even aware of the dangers. Many jobs exposing workers to dust or other exposure agents have been externalized from Finland to countries with low production costs. Automation has advanced, processes have improved, and legislation has been tightened. Generally speaking, the safety level is higher than earlier. – But we may ask, is even this level acceptable? For example, the guideline values and threshold limit values of substances are continually going down, as new health hazards are found. Our understanding of materials changes, Koponen reminds. Much information exists about chemical control, but it is scattered. A digital key account management model would help an enterprise to find suitable information namely for its own needs. Research has shown what kind of a system would be optimal, but its practical application lacks funding. – Such a system would provide guidelines for taking care of legally stipulated basic requirements. 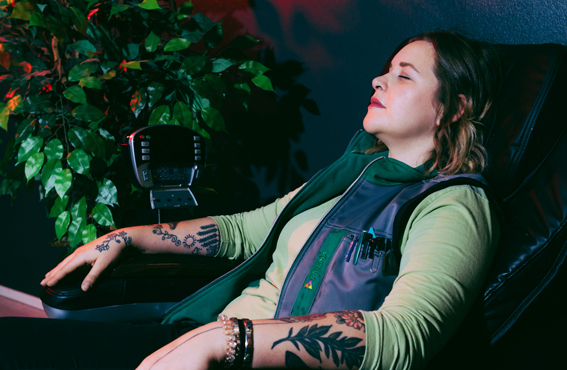 It would also offer suggestions on how to create a pleasant work environment which supports job satisfaction and well-being at work, and is productive at the same time, explains Milja Koponen. ‘Healthy Work’ is the campaign theme of the European Occupational Health and Safety Agency in 2018–2019. Its aim is to promote and disseminate feasible practices, and to provide effective tools for controlliing chemical risks. Senior inspector Satu Auno says that this theme should be promoted actively on many fronts. – An EU level campaign produces knowledge, occupational safety authorities disseminate it on their inspection rounds, and trade unions and employers’ organizations through their own communication channels. Everyone’s efforts are needed, including those of vocational institutes. When everybody takes personal responsibility, safety awareness improves. Chemicals can irritate, corrode, and sensitize. Skin symptoms, eye injuries, respiration problems and asthma, poisoning, cancer, reproductive health problems, etc., are some of the detrimental effects on the human body. Sometimes the problems develop gradually and are hard to define. Chemicals are the cause of relatively few accidents, but when a chemical accident does happen, it is usually very serious, for instance a dust explosion or a solvent or acid leak. For every accident, there are dozens of lesser incidents that lead to some kind of health problem. Several studies have shown that the association between an accident and the risk of getting a disease is very high. When an employee breaks his ankle, he immediately goes on a sick leave. A long sickness absence of a skilled worker can be seen in the enterprise’s balance sheet. The impact of an undefined lowering of work ability and for instance a slowly developing cancer is much more difficult to determine. – Young people should already in school learn to appreciate their own health. They have a 40-year work career ahead of them, says Koponen.